Sweden is a country in northern Europe. It occupies the eastern portion of the Scandinavian Peninsula. Stockholm is the country’s capital and largest city. The country extends nearly 1,600 km from north to south, and 1/7 of its territory lies above the Arctic Circle. Thick glaciers that receded after the last ice age scoured the land, rounding mountaintops, scraping out deep valleys, and carving long fjords into the coastline. Nearly 100,000 lakes dot the landscape and cover about one-twelfth of Sweden’s total area. Sweden shares a hilly land boundary with Norway to the west, and it touches Finland to the northeast. Elsewhere it faces water. The Gulf of Bothnia and the Baltic Sea lie to the east. To the south and southwest lie the waterways separating Sweden from Denmark: the Skagerrak, Kattegat, and Öresund straits. Two sizable islands in the Baltic Sea, Gotland and Öland, are also a part of Sweden. Thousands of rocky islets fringe Sweden’s Baltic coastline, sheltering the mainland from the open sea. Thick forests, narrow lakes, and swift-flowing streams cover much of the sparsely inhabited northern 2/3 of Sweden. In the far north, above the Arctic Circle, the land is desolate and remains frozen for most of the year. The lowlands of the southern third of Sweden are home to most of the population, agricultural lands, and industries. Once a relatively impoverished farming nation, Sweden rapidly industrialized beginning in the late 19th century. Swedes turned to their vast forests, extensive waterpower resources, and rich deposits of iron ore to build an economy centered on the export of manufactured goods. Today, services drive Sweden’s economy, but manufacturing remains very important, and the quality of Swedish engineering and industrial design is widely acclaimed. 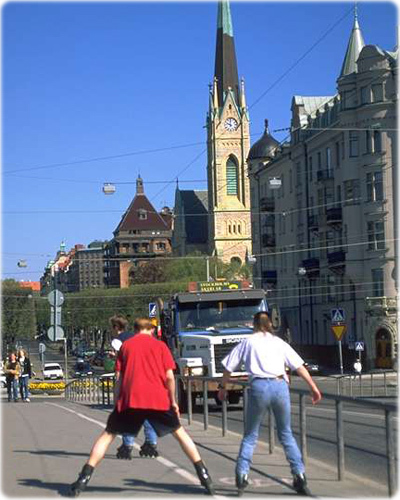 Sweden is famous for its mixed economy, a system in which the government plays an active role in guiding economic life. Swedes enjoy one of the world’s most comprehensive social welfare systems and a standard of living that is unsurpassed. More than 1,000 years ago, Swedish Viking seafarers dominated the Baltic Sea and established far-reaching trade routes. Swedish armies later conquered an empire that included Finland, much of Norway, and parts of Russia and Germany. Today, Sweden is noted for its neutrality in foreign affairs. Skeppsbron at Christmas, Old Town, Stockholm. The big Christmas tree on Skeppsbron is the largest real Christmas tree in the world. It is 38 m high and decorated with 5000 lights and a four meter star at the top.